A common request from those travelling around the Buddhist periphery looking for alternatives to traditional Buddhism is for innovators and critics to provide practical solutions and responses to the theoretical critique being made. I myself have been one of those who at various times in the past has asked for something practical to be done with all the theory and it behoves me now to do my part to bridge the gap between theory and practice but also remind listeners and readers that theory is itself the child of pragmatism and always results from action; the action of thought, contemplation, reflection, analysis, questioning, doubting and so on. 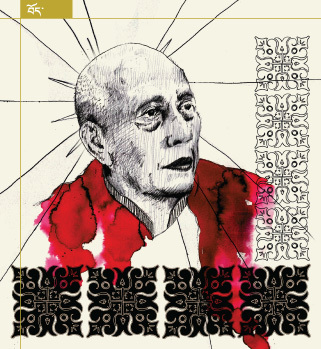 Theory, therefore, will continue to be a cornerstone of practical, pragmatic approaches to engaging with Buddhism anew and makes up a great deal of the practical side of engaging with Buddhism from a post-traditional perspective. Emphasising the role of theory is essential as one of the important contributing factors that has allowed Western Buddhism to give rise to its more problematic facets is the general US culture of anti-intellectualism that has accompanied the rise of Ronald Reagan, George Bush, and now Donald Trump: I know I shouldn’t, but I simply couldn’t resist referencing these key figures involved in the dumbing down of American culture. Having been the Empire of the last century, The States has obviously had a very strong influence on Europe and the rest of the world and this includes not only its political and economic exports and political ideology but also in its exportation of cultural forms and styles, so that, although Europe generally does not suffer from the American suspicion of intelligence, nuance, subtlety and sophistication, it has accepted, in the world of Western Buddhism at least, a creeping form of anti-intellectualism, and in the world of the spiritual but not religious, an obsession with first person subjectivity and the cult of feeling. Starting out with the practical business of thinking, therefore, is an essential initial step because, as our more intellectual readers are all too familiar, theory, in the form of ideas and beliefs in particular, underlies, shapes and colours all of the practical stuff that our more down-to-earth brothers and sisters like to front. This marks the beginning of a new series of posts on a post-traditional approach to Buddhism. This initial offering is on the Four Noble Truths. I realised that I needed to get to grips once again with this essential Buddhist teaching and do my best to rework it into contemporary language. 1. Suffering, unsatisfactoriness, dissatisfaction, disappointment, illusion and confusion are an inescapable part of life. 2. There is a root cause for these. 3. There is a way to work with and eventually remove this cause. 4. There is a practical method for doing so accessible to anyone willing to apply themselves.